Now what does one say about not posting for such a long time? For sure, it is not that I have become lazy or lost interest in my blog. I am sure being busy on all fronts in life should qualify as enough reason for not blogging. But the blog is not too far from my thoughts. It eats at me every morning when I realise one more day has passed without anything new on here. This is now a far cry from my earlier post on being addicted. So now I have decided that If I can't do it then I can't do it. No pressure, right? Hopefully I should be able to accelerate the cooking, photo taking and the posting to keep the momentum going. Let me quickly get to the point now. Doesn't the name Tutti Frutti Cookies make you feel a kid again? Some things are always associated with childhood and I think the word tutti frutti features right on top of that list. I loved tutti frutti ice cream as a kid. How many of you remember that silly ball ice cream? I think Kwality made that. It was only ordinary vanilla ( not that vanilla can ever be ordinary) But we would simply die to eat that. And then carefully wash it out and use the plastic to play for a bit. I cannot still understand my fascination for that but well... thats how childhood is, I guess. Anyway, here is the quick and easy recipe. Soften the butter and add the brown sugar. Mix well till light and creamy. Add the egg and vanilla essence and mix well again. Sift the dry ingredients. Add to the butter sugar mixture. Add the tutti frutti. Roll into logs of 2 inch diameter. Put it into the refrigerator for about 4 hours. Cut into thin slices and bake at 170 deg C for about 8 minutes or till done. Welcome back!...I guess once you stop posting you kind of become lax in that..continue the momentum...you will be able to do it. Those cookies look lovely...I remember all sorts of Tutti Frutti items...I guess those are still available..
Those cookies are really cute and colourful...and I remember tutti fruttis....we used to have a sweet bread made with them...and I would gleefully would pick out those bits as a kid...nice to have you back. Really colourful dear. Love anything with fruits. Oh I used to love tutti frutti, couldn't agree more, totally reminds me of my childhood. These cookies look so good! yeah!!!! i remember those tutti frutti goodies. My sis fav. I use to prefer tutti fruti bread than cake. Thanks for taking me back to childhood. 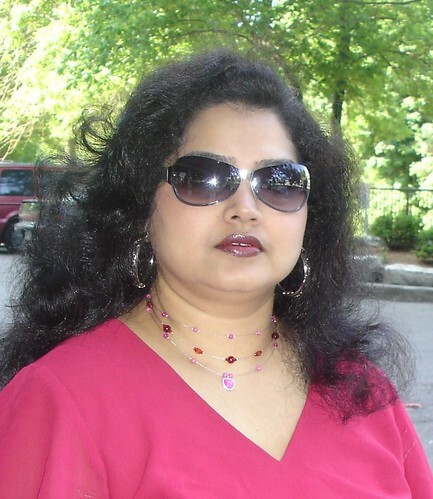 Kamini, Blogging is a hobby. Take yr time and enjoy doing it. Cookies look colourful. Its been ages since I have had these biscuits and fruity bread. Don't feel any pressure, you should be blogging when you feel like it :) Besides, these tutti frutti treats are so awesome, I could keep reading about them for days! those cookies make me wanna be a kid again. talk about childhood, i still love them a lot. 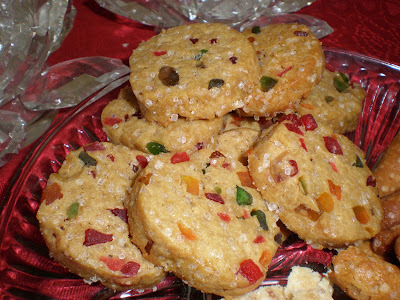 Love the tutti frutti cookies. Wow those cookies look so Christmassy. As a kid I used to just pick those tutti fruttis hee hee. Looks so gorgeous.